Only a few days ago, we heard that Transistor would be Supergiant Games' follow-up to Bastion and that it would be playable at PAX East 2013. Lucky convention-goers can play an early build of the game, on course for a 2014 release on unconfirmed platforms. 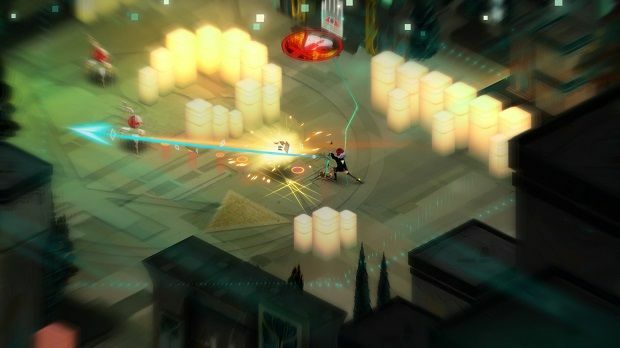 Transistor bears resemblance to Bastion in a few ways: the isometric viewpoint and beautifully painted visuals immediately brought to mind 2011's indie darling, but Transistor plays very differently from its predecessor. Transistor stars Red, a popular singer who is being targeted by a group of assassins for unknown reasons. At the start of the demo, she nervously walks over to a large blue sword protruding from a dead body. This is the Transistor, and he calls out to Red to take him with her. 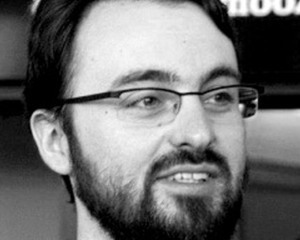 You'll recognize the voice straight away as Logan Cunningham, who voiced the narrator Rucks in Bastion. Red, just like the Kid, is mute and the Transistor makes a cryptic mention of her attackers "taking your voice." As Red makes her way through the beautiful cityscape, she's attacked by spherical robots with glowing red eyes, and this is where the Transistor shows it's use. A press of the right trigger shifts the game to a tactical view: the background fades away and a reactive grid is overlaid on-screen. The grid is there to help in targeting, and Red can move to different points along it but is not bound to them. At the start of the demo, the Transistor only has two abilities: a simple slash ability and the Burst. The latter is the more useful, as it will send out a bust of energy that will pass through enemies; get two or three in a row and you can take groups of enemies really quickly. Eventually, a melee attack and a jaunt attack fill out the Transistor's arsenal, which help when the Transistor recharges itself: during this time Red can enter the tactical view and fend off enemies. Red can queue up commands that you'll see on a bar at the top of the screen, but you can cancel any action with the left trigger. As combat begins, blocks will rise from the ground, filling out the tactical grid and making cover. The cover is fairly fragile, but it allows some tactical depth: you can destroy cover to attack enemies, although this will leave Red vulnerable. As Red and the Transistor make their way through the world, they encounter more victims of the robots. "Hundreds" of people have been going missing in the city "in a few months," and Red was due to be next. Instead of fleeing from her synthetic attackers, the demo concludes with Red seeking them out in their home world, called The Process. 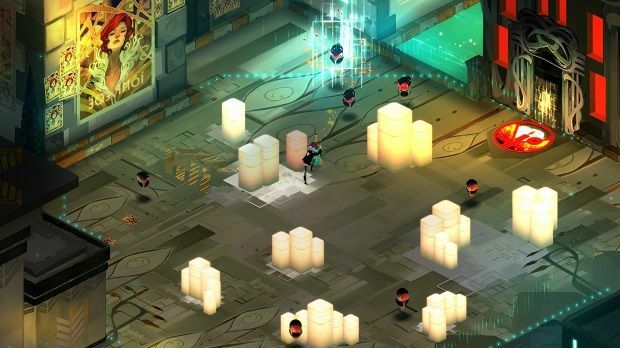 Transistor has been in various stages of production for the last year, but Supergiant took breaks to work on the iOS and Google Chrome versions of Bastion, according to audio lead Darren Korb and art director Jen Zee. Korb admitted that there's pressure to follow up on Bastion's success, but the team "want to make a game we're happy with." There is no publisher attached to Transistor yet but the Supergiant guys aren't necessarily looking to publish the game themselves, so we'll need to wait and see if someone will pick Transistor up. As we've come to expect at this stage of the console cycle, there are no platforms confirmed for Transistor but since Bastion appeared on a consoles, PC and iOS it wouldn't be a surprise to see the same happening with Transistor. For those not at PAX East 2013, you'll have to wait for 2014 when Transistor will hopefully be arriving.